There were about 15-20 walkers each day as we went through the beautiful Wisconsin countryside – Waunakee, Lodi, across the Merrimac ferry, camping at Devil’s Lake State Park and Rocky Arbor, up through Mauston and New Lisbon, and ending at Volk Field. It was eight nights of sleeping in the homes of supporters, in tents, and in church basements. The walk participants kept going through inclement weather that is not typical for Wisconsin in August. There was rain, heavy wind, and very cool temperatures during the walk. The cooler temperatures were better than walking in 90 degree weather, but it still made for a difficult walk. However, they kept going 12-15 miles each day, persistent and determined. What kept us going like this for eight days? People choose to be involved with the walk, knowing it would be difficult and push them to their limits, but also knowing that the militarized violence, both abroad and at home, is causing grave suffering to many innocent people and we must do something about it. We must speak out, raise awareness, share our concerns, and most importantly call for change. And that is what we did all along the route as we built bonds of friendship and connection with each other, and provided outreach and education along the way. We called for change in front of the City/County/Jail complex in Madison at the beginning of the walk, and we called for change at Volk Field at the end of the walk, as well as all along the route. The walk came to an end at a beautiful rest area next to a noisy freeway near Volk Field. Volk Field is a Wisconsin Air National Guard Base near the village of Camp Douglas, WI. One of the jobs there is to train personnel to operate Shadow drones. Though the Shadow drones do not carry weapons (at least that is what we are told), they carry a camera that is used for target acquisition, surveillance, and assessment, and they are part of the bigger program of drone warfare in this country. 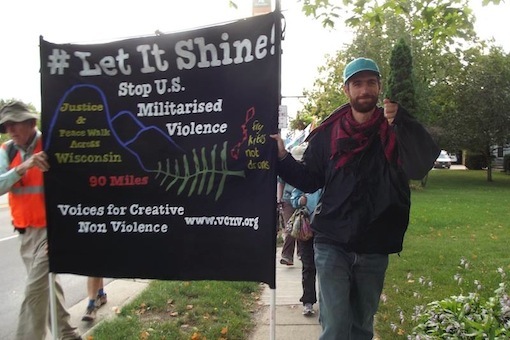 The Wisconsin Coalition to Ground the Drones and End the Wars has been vigiling at the gates of Volk Field for 3 ½ years – with three actions of nonviolent civil resistance during that time. After a picnic lunch we formed our final circle to discuss details for both the vigil and risk arrest action, we read the nonviolence guidelines, and we shared a poem. Then we were ready to process to the gates of Volk Field. We walked slowly and solemnly to the gates with a drum beat and a lone voice singing a mournful chant. We walked to the gates with heavy hearts, remembering those who have died in drone strikes and as a result of police violence. Some of the signs we carried were pictures of children who have been killed by drones, stating, “U.S. Drone Warfare is Terrorism”. Image taken by Lars Prip. 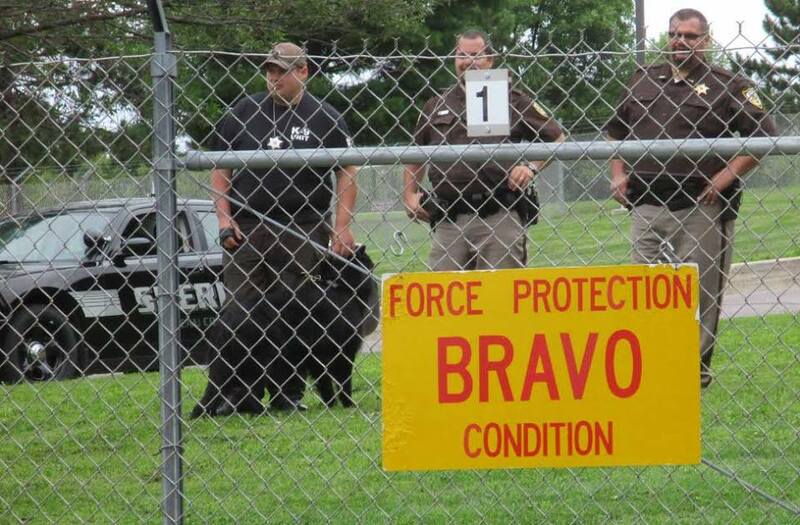 The Juneau County sheriff was at the gate with several of his deputies when we arrived. There was also a police dog, which they have never used with us in the past. We stood, as we always do, on the grass under a big beautiful tree. Buddy and Xan began to sing the names of victims of militarized violence, going back and forth between the name of a drone victim, and then the name of Black woman who was killed by the police in this country. After each name the crowd responded by singing, “We remember you” and a single drum beat. After listening to the names for a few minutes, those of us who were going to risk arrest stepped off the curb and onto the road. We slowly walked towards the gate feeling the pain of living under a government that could commit these acts in our name. We took one step onto the base and were immediately taken into custody, handcuffed, and put into a police car. We were handcuffed in front, given a bag of food once we got to the jail, processed and released within about four hours. We were arrested for disorderly conduct and also given a citation for trespassing. We have a court date on September 30. The arrestees were Bonnie Block, Cassandra Dixon, Joyce Ellwanger, Joy First, Jim Murphy, Phil Runkel, Mary Beth Schlagheck, Tyler Shiffer, and Don Timmerman. Even though it was one of the easiest arrests I have been through, it nonetheless felt like a powerful action. The whole eight days built up to this action where we were able to really make the connection between militarized violence at home and abroad. It is time for real action and real change in polices regarding drone warfare and police violence. We cannot, we will not rest until we have peace and justice. Let it shine! And let’s keep working. Join the discussion on the Madison VFP Facebook page. This entry was posted in Clarence Kailin Chapter 25 and tagged drones, Volk Field on August 28, 2015 by Website Administrator.